Some days I constitute a "Pajama Day". Pretty self explanatory, we never change out of our pj's and we spend the day usually doing crafty/Pinterest-y things. 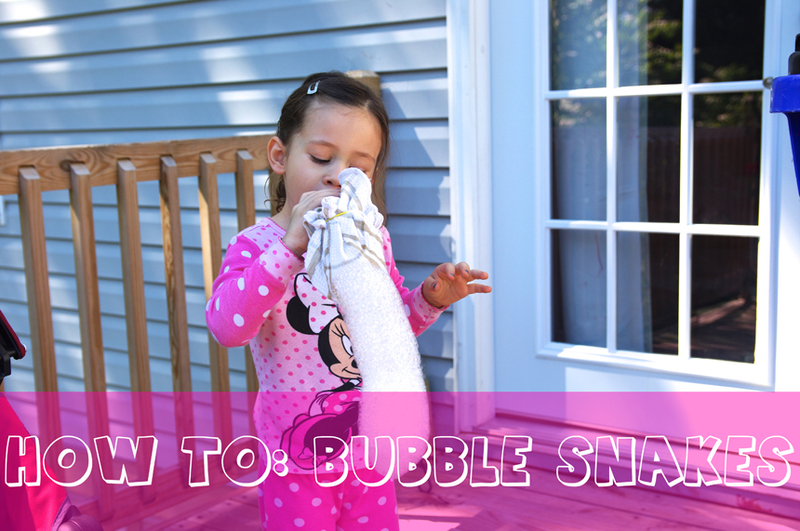 A few days ago I wanted to try the indestructible bubbles on Pinterest (has anyone tried those?!) but went with the Bubble Snakes because, well, I am lazy and that took less time than trying to find corn syrup. Cut out the bottom of the bottle, wrap the washcloth over the bottom, secure with a runner band and there you have it! Dip it in the bowl and start blowing. I usually take this opportunity to take some actual pictures of the girls, since my DSLR sits unused most days. She got pretty good at the whole bubble snake thing. Notice Harper's enthusiasm. Finally got a smile out of grumpy pants. This little cutie wanted to join in the fun. My beautiful, stubborn, hilarious, ball buster of a 3 year old. Even the camera scared her....poor girl. Isn't she a cutie though? These 2. She usually doesn't care for Reagan but then I catch these moments and think this is the dog that she's going to grow up with. The dog that will be with her through the beginnings of school, new houses, new friends and everything in between. While she still asks when we can get "another Trigger", she really has learned to love this little pup. Pajama days are my favorite.